Welcome to our Harrahs Casino review! Please don’t forget to contribute to the page by sharing your honest experience with other OnlineCasinoBluebook.com readers. In 2013, HarrahsCasino.com became one of the first regulated iGaming sites to be available for New Jersey residents. While this may seem relatively recent in the online gaming world, HarrahsCasino.com is one of a trusted and select number of casino operators with the proper licensing for online gaming and gambling. HarrahsCasino.com is the online operating arm of Harrah’s Casino. One of the largest brick and mortar casinos in the world. Players can trust in the name and the security of HarrahsCasino.com solely on the relationship, safety, and reputation of the Harrah’s brand. Harrah’s is licensed through the New Jersey Division of Gaming Enforcement for all players over the age of 21 who are playing within the border of the state of New Jersey to play for real money. The gaming software powering HarrahCasino.com is state of the art and driven by 888’s propriety software, Dragonfish. The user interface is friendly and easy to manage. Inside the casino, players will a variety of blackjack, video poker, online slots, and roulette to choose from. Another awesome feature of HarrahsCasino.com is the ability to play remotely on a mobile device through the Apple AppStore. Like all great online casinos, Harrah’s offers some tremendous bonus and deposit bonus options for all New Jersey based players. Welcome Bonus – Valid only on first deposits, Harrah’s is offering a 100% match up to $300. Registration and deposit are required for this promotion, but it’s a great chance to double an initial investment. Deposit Match – Deposit match varies throughout the year, often with special offers in relationship with certain dates, events, and holidays. An example would be the current promotion featuring a 20% bonus match on player’s next deposits up to $500 using the code 20MORE. 20 Free Spins – The 20 Free Spins promotion is ongoing and is only available on certain slot games. No deposit is needed to claim these free spins, and it is a great way for players to test the waters of online gaming while having an opportunity to win real money. The 20 Free Spins are available on the Freaky Fruit, Knights and Maidens, and Euro Reels games. Player Rewards Program – Easily one of the coolest features of the site, Harrah’s has the ability to link rewards credit directly to a player’s Total Reward program. This means that all rewards point garnered through online play will be redeemeable for room discounts, special gifts and trips, and all the benefits of Harrah’s and the Total Rewards program. There are 4 levels of the Total Rewards program and benefits vary depending on how much players gamble at any time. The levels are: Gold, Platinum, Diamond, and Seven Star (invitation only). Rewards credit can also be transferred to a personal Total Rewards account to be redeemed for comps inside of Harrah’s casino. HarrahsCasino.com is operating under the Dragonfish Total Gaming Software platform operated by 888.com. Not only is this software cutting edge and industry specific, it is trusted by the WSOP.com poker room, and all 888 operated sites in New Jersey and Delaware. The overall casino interface is simple to understand and exciting to tour. A great feature for those outside of NJ or only looking to test the waters is the fact that all Harrah’s Casino games can be played with play money on the website. The main operations of HarrahsCasino.com take place in a brower based format. There is no software needed for download, or stuff to store on your computer. Users should run into any browser issues as all software is compatible with Mac, Google Chrome, FireFox, and Bing, among others. The Harrah’s Casino mobile platform is an awesome feature for players on the go. With so many games available for all iOS devices, it is great to finally have a NJ based online app for players to play with real money. While the mobile app does not have the full variety of the online site, there are a variety of games to choose from for mobile play. HarrahsCasino.com does not offer a live dealer game option, but with the growing popularity and innovation around this feature, it is reasonable to assume that a live dealer feature is in development. Perhaps one of the most important feature of any online casino is that of Customer Service and Support. HarrahsCasino.com offers 24/7/365 Customer Support that can be contacted through email at NJSupport@HarrasCasino.com, Toll Free in NJ at 1.855.218.6230, through a formal complaint procedure, or through an official Internet Gaming Dispute Form. For player convenience and security preferences, there are a number of online deposit options available. One of the most convenient is through a Visa credit or Debit card, but Harrah’s also accepts deposits by Bank Transfer (ACH), PayPal, Mastercard, Neteller, PayNearMe, Online Banking Transfer, or directly at the Cage at Ceasar’s Atlantic City Casino. One of the most often overlooked aspects of playing online is player’s failing to understand how withdrawals and payouts are made. 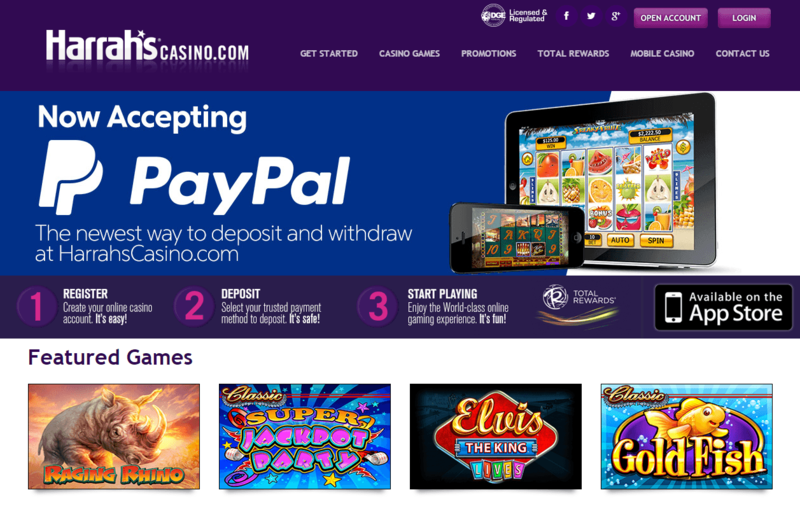 This is the most fun part gambling and HarrahsCasino.com makes it simple with 5 different options from Bank Transfer (ACH), Bank Draft, PayPal, Neteller, and directly for real money at the Cage inside Ceasar’s Atlantic City Casino. 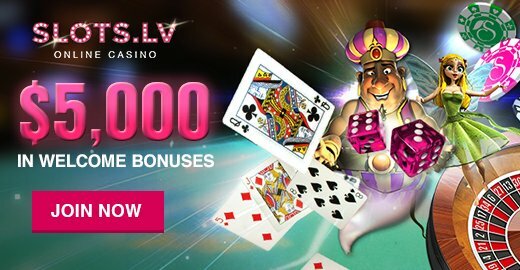 HarrahsCasino.com is a trusted internet casino licensed by the State of New Jersey and meets all requirements for providing real money online gaming. HarrahsCasino.com is also 100% safety verified and protected through state of the art industry-specific security software. Customer Supports is available through a number of contact options and is available 24/7/365. There aren’t many names in Casino Gambling bigger than Harrah’s, and it shows in their wonderfully runs and graphically rich website, HarrahsCasino.com. Their experience shows in the way the software and games are presented, and how well customers are treated. The mobile app leaves a little to be desired with limited games, but the VIP and rewards system more than makes up for it by making players feel welcome and appreciated. All in all, it is hard to say anything bad about Harrah’s as one of the most successful casino operators in the world. Thank you for reading our Harrahs Casino review!